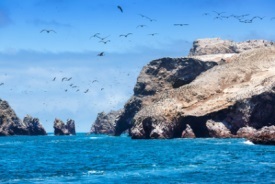 Lobos de Tierra is a steep and rocky island rising more than 200 feet from the Pacific Ocean. Several smaller islets surround it, including El León and Albatros. A diverse community of marine mammals and seabirds surround these islands. Sea lions bask on the beaches and hundreds of Blue-footed Boobies can be viewed ashore while Peruvian Pelicans pass overhead.